Even though my home looks like a bomb has hit it, at least I was able to take inventory and condense a lot of it! So where do I go from here? I'm definitely going to have a yard sale this coming weekend. Hopefully people will find my old treasures as endearing as I once did! And sometime in April I'm going to have a massive Cookie Lee sale to rid myself of all the jewelry from past seasons! P.S. 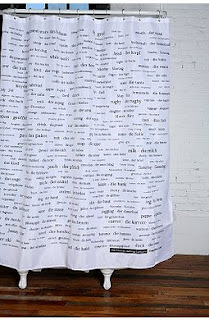 Check out the Learn a New Language Shower Curtain from Urban Outfitters! I think it's a must! Not even close, Love ;) But we're getting there!